Ballarat is Victoria’s largest inland city. It started back in 1838 when a squatter called William Yuille camped on the shores of the Black Swamp, now known as Lake Wendouree. “Balla” “Arat” was derived from the meaning resting or camping place. Gold was discovered at Poverty Point in 1851 by John Dunlop and James Regan who found a few ounces while panning in the Canadian Creek. By the following year there were around 20,000 diggers searching in the shafts of the Ballarat Goldfields. Due to this population explosion, Ballarat was proclaimed a town in 1852. 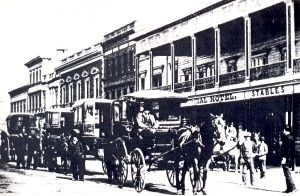 By 1855, Ballarat was a municipality, a borough by 1863 and a city in 1870. By the early 1850’s, the Government in Melbourne had set up a system of Gold Licences to allow miners to search for gold on a specified piece of land. The Licence fee was paid regardless if the miner found gold or not. If found without a licence, the digger was forced to pay a fine of 10 poundsÃ‚Â or be chained to a log until the fine was paid. The diggers became frustrated over the frequency and corrupt manner of how the Goldfields Police went about their Licence checks. Due to a shortage of manpower, many of the police were ex-convicts. The Government gave them the power to undertake checks, and many, because of their background went about their duty in a ruthless manner. The diggers had no say as they had no representation in Parliament. By 1854, the Police ordered twice weekly licence checks due to the lack of co-operation from miners. This caused more resentment around the goldfields. On October 7 1854, James Scobie was murdered at Bentley’s Eureka Hotel. On October 12, after a riot by miners, Bentley’s Hotel was burned to the ground in protest of Bentley’s acquittal of murdering James Scobie. Three miners were arrested and sent to prison. A retrial followed later and Bentley and two others were found guilty of the manslaughter of James Scobie and sent to prison. On November 11, the Ballarat Reform League was formed with the view of abolishing licences and having the miners released. Due to the lack of response to these demands and set up a stockade on the Eureka Lead. Led by Peter Lalor, on by authorities and the miners increasing frustration, the miners burned their licences the 3rd December 1854, the miners went into battle after Government soldiers unexpectedly stormed the stockade early that morning. The battle lasted for around fifteen minutes and in that time up to thirty miners and six Government troopers were killed. One hundred and fourteen miners were taken prisoner. Within six months, legislation was passed to give miners a fairer deal. The monthly Gold Tax was abolished and miners were given the right to vote., Installed was a miners right costing 2 pounds per year later reduced to 1 pound. People could now see the injustice of the whole situation. All miners arrested after the rebellion and those sentenced for the burning of Bentley’s Eureka Hotel were released. Peter Lalor, who had been in hiding since the uprising came out of hiding. He became the first member for Ballarat West to be represented in the Legislative Assembly and later became Speaker of the House. In the year 1858 the second largest gold nugget ever found in Australia, the “Welcome Nugget” was found at Bakery Hill, Ballarat. By the 1860’s, the prospect of finding gold in Ballarat East had nearly diminished. By this time, many of the alluvial mines in that area had declined and companies were formed to start much deeper mining in the West and South of Ballarat. To establish these mines, heavy equipment was needed. Foundries such as the Phoenix Foundry were established to cope with this demand. By now, the town was supported by industries such as flour mills and agriculture related companies. When the rail came through in 1862, it opened many more opportunities such as shops and markets, trades like blacksmiths had been established many years earlier to expand both towards Melbourne and the Wimmera. When the last mine closed in 1918, Ballarat had enough industry and service bases to support it for many years to come. Today Ballarat is a major industry city with well known companies such as Mars Confectionery, McCains Foods, Bendix Mintex, Timken and Selkirk Bricks all established in Ballarat. Some of the area’s primary industries include, gold, clay, potatoes, wool and meat. Ballarat is easily accessible by road, rail and has an airport. It has a strong service and tourism base with attractions like Ballarat Fine Art Gallery, Sovereign Hill, Montrose Cottage and Eureka Stockade allowing the visitor to experience what it was like back in the gold days of the 1850’s. One of the most often asked question is “Do you spell Ballarat with four a’s or three a’s? It is generally accepted that the origin of the name came from two aboriginal words signifying a camping or resting place – “Balla” meaning elbow or reclining on the elbow and “Arat” meaning place. The first white settler (1837), Scotsman Archibald Yuille, called his property “Ballarat”. We cannot know how a Scotsman pronounced an aboriginal word, but in 1851 another Scot arrived to officially survey the area and he recorded the towns name as Ballaarat. When the first local paper arrived in 1854, three years later, it was called the “Ballarat Times” (perhaps the typesetter ran out of “a’s”). Prior to amalgamation of the councils in 1994, the municipality of the City of Ballaarat was the official spelling for the corporation that was the Council, though the official spelling for place name purposes of the area (then comprised of several municipalities) was Ballarat. Therefore both spellings were legitimate at different times in the city’s history and can still be seen on buildings and in historical literature. As extracted from W B Withers “History of Ballarat” which was first published in 1870 (page 13). Wendouree is the anglicised form of Wendaaree, a native word signifying “be off”, “off you go”. Yarrowee is probably a Scottish settler’s use of the Scottish Yarrow, with diminutive to suit the smaller stream. Buninyong or, as the natives have it, Bunning-yowang, means a big hill like a knee – bunning meaning knee, and yowang hill. This name was given by the natives to Mount Buninyong because the mount, when seen from a given point, resembled a man lying on his back with his knee drawn up. Warrengeep, corrupted to Warrenheip, means emu feathers; the name was given to Mount Warrenheip from the appearance presented by the ferns and other forest growths there. Gong Gong, or Gang Gang, is an aboriginal name for a species of parrots. Burrumbeet means muddy water, and Yoady Yalock standing water.